The adidas Ultra Boost 3.0 will soon be hitting retailers, and here’s a look at the adidas Ultra Boost Blue Silver version that will be debuting. This brand new Blue and Silver colorway of the third installment of the adidas Ultra Boost features the brand new Primeknit patterned upper. Making them perfect for the colder months, the new build is a bit thicker than the traditional Primeknit. 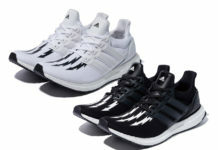 Metallic Silver covers the heel counter, while sitting atop a White Boost midsole and Black rubber outsole. Take a better look at this upcoming adidas Ultra Boost 3.0 below and look for them to make its debut in the coming weeks. Keep it locked to Sneaker Bar for further updates.